Of all the sayings in the English language, few hold truer than “You never get a second chance at a first impression.” Atlanta area businesses in the know make that first impression count with reception furniture from NorthPoint Office Furniture. Whether you need comfortable guest/reception seating, end tables, coffee tables or reception desks, our company is sure to have what you need in a variety of styles and options. Need a U-shaped desk to position your receptionist prominently in front of your logo? We have that. Need a pedestal desk with a dark stain that exudes elegance throughout the lobby? We have that, too. Need ergonomic seating for your guests and potential clients? You better believe we have it. Whatever your reception furniture needs in Atlanta, Marietta, or Sandy Springs, the massive inventory and helpful staff on hand at NorthPoint can surely provide. While you are updating your reception furniture to impress visitors from the moment they walk in the door, you should consider extending that awe-worthy décor throughout your office. Our company offers office furniture such as chair choices, PC desk options, workstations and other furnishings that will leave your guests feeling confident that yours is a business that is going places. Why not take a little bit of that impressive feeling home with you? 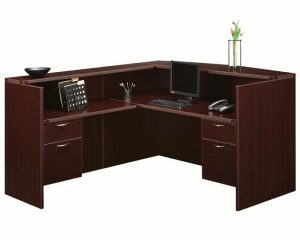 Our home office desk selection is sure to have something that will match the style of your study or computer room. Stop by our 8,000 sq. ft. showroom in Roswell, GA, to check out our reception furniture inventory today.